Ehhh! Happy New Year, y'all! We know most of you are reading this through the hazy fog of a hangover - trust us, we are too. We hope 2013 was as amazing for you guys as it was for The Movement Fam. After eight music videos, twoEPs, a mixtape, a summer tour and a ton of beers, we figured that with all the support we received last year we owed our TMFers a little something to set off 2014 right. Notion's 'So Cold' video kick started 2013 off real proper-like for The Fam, so it only made sense to do it all over again. We teamed up with Shane Russell from 9Block Productions (responsible for 'When The Chips Are Down' and 'Perfect Definition') encore une fois to create the visual for the first single from Nosh's 'Pride On My Cufflinks' EP, 'Young & Crazy'. The video was shot in Montreal on a stormy day in July last year, with the Old Port, Quartier des Spectacles, Benelux Brewpub and annual summer fireworks contest providing the backdrop for Notion's moody anthem. With an uplifting narrative that preaches the virtues of enjoying your youth while you still can, this soulful banger lit up every venue on the tour. Shouts to the Fam Cee, Tiffany Alexis and iLLvibe on the cameo tip. You can catch the video in HD on 9Block's Vimeo page, or roll by The Movement Fam's YouTube channel to check it out. The video will be officially released to the public on Friday January 3rd 2014, but we wanted to give something back to the people on the first day of the new year. Respect! 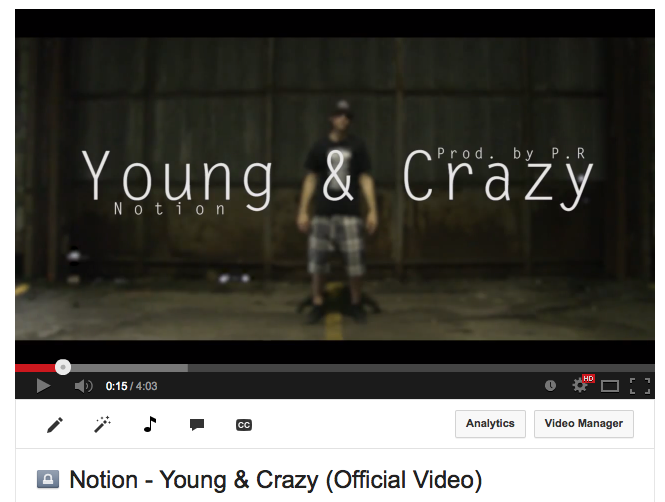 Notion - "Young & Crazy" OFFICIAL MUSIC VIDEO from 9Block Productions on Vimeo. And while you're at it, cop 'Pride On My Cufflinks' from either Bandcamp or iTunes!